Today’s image is from Montgomery County, Georgia. At its top, we see “Mark Mayo Register of Probates.” Under that, “Marriage Licens.” The dates range from 1796 to 1798. One man on my research list for Montgomery County was named Moses Hornsby, a man born 9 December 1749.1 Moses had married in Fairfield District, South Carolina, before moving to Georgia. He was a newlywed on the 1790 census of Fairfield, where he was said to be over 16 with two females—ostensibly a wife and daughter.2 Eventually two of their sons migrated to Texas, where their family records named his wife as Katherine Watts, from a nearby Fairfield family.3 So, even though upcountry South Carolina did not maintain marriage records at that time, we have a wife’s name and a time frame for Moses Hornsby’s marriage. Descendants, all these years, have said that the girl he married in South Carolina was the mother of all his children. But then I discovered this record. There was only one Moses Hornsby in that time and place. He is here, on this list of men—a list labelled marriage licens[es]. If we look only at this record, and take its words at face value, the superficial conclusion is that Moses Hornsby has taken a second wife, between June 1797 and March 1798. But we cannot just take a record at face value. We must always study the context of the information. As background, you should know that this list is the only known form of “marriage records” that exists for Montgomery County during these years. The list is not in a register of marriages. It’s just a loose scrap of paper that has been microfilmed along with other loose scraps of paper from the courthouse. Hornsby is the only one with no date after his name. Hornsby is the only one on the page for whom the words “Marriage License” appears after his name. Hornsby is the only one who has initials after his name: RP. Why is he being treated differently from all the other men on this list of “marriage licenses”? Unexplained oddities should always be a madly waving red flag, telling us that we need to stop and study what’s going on. Never mind this Georgia document that seems to say Moses Hornsby married again in Georgia. He didn’t. When we put this one-line entry about Moses into the context of all the other entries on this page—their construction and their wording—we’re left with a totally different interpretation of the record. Moses Hornsby was a minister—apparently of the Reformed Presbyterian faith—who, between June 1797 and March 1798, was granted a license to marry others. 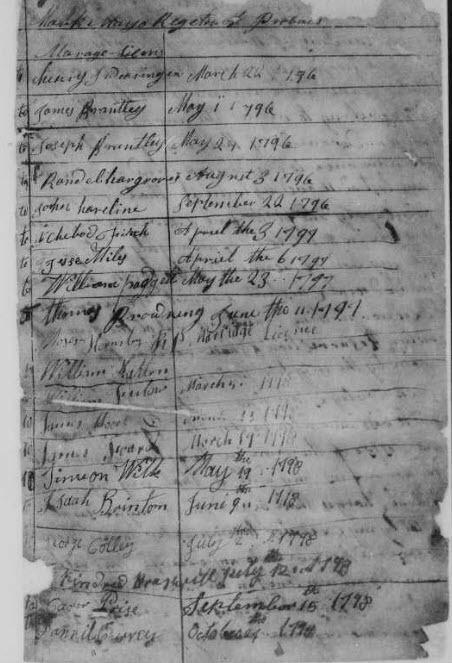 “Montgomery County Marriage Licenses, Inventories, and Wills, 1796–1798,” unnumbered sheet labeled “List of Marriage Licenses beginning March 22, 1796”; Family History Library microfilm 159,033. 2. 1790 U.S. census, Fairfield District, SC, p. 150, line 24. 3. Rex McLaurin, “Genealogy Report: Descendants of Leonard Hornsby,” Genealogy.com (https://www.genealogy.com/ftm/m/c/l/Rex-Mclaurin/GENE1-0006.html : last accessed 11 February 2019). Moses and Catherine Hornsby’s first son Reuben Hornsby was a surveyor for Steven F. Austin and founder of Hornsby Bend, Travis County, TX. McLauren (https://www.genealogy.com/ftm/m/c/l/Rex-Mclaurin/PHOTO/0002photo.html) offers a photograph. For Catherine's family, see Elizabeth Shown Mills, "Frontier Research Strategies—Weaving a Web to Snare a Birth Family: John Watts (ca. 1749–ca. 1822)," National Genealogical Society Quarterly 104 (September 2016): 165–90; archived online at Mills, Historic Pathways (https://www.historicpathways.com/download/JohnWattsNGSQSep2016FINALGalleys.pdf). 4. Affidavit of "Caty Hornsby and Moses Hornsby,” 29 November 1821, Covington County, MS; filed in Ouachita Parish, LA, Succession file A1082 and Succession Book C: 31–38, estate of “Thomas Watts of Richland District, S.C.,” particularly p. 30. Elizabeth Shown Mills, "The Importance of Context," blog post, QuickTips: The Blog @ Evidence Explained (https://www.evidenceexplained.com/quicktips/the-importance-of-context : posted 11 February 2019).